A Personalized Heart Strings Womens Fitted T-shirt is both comfortable and great looking when decorated with all of your Sister's names. Sisters make the world a better place, so why not show them off on this affordable Personalized Sister Gifts. 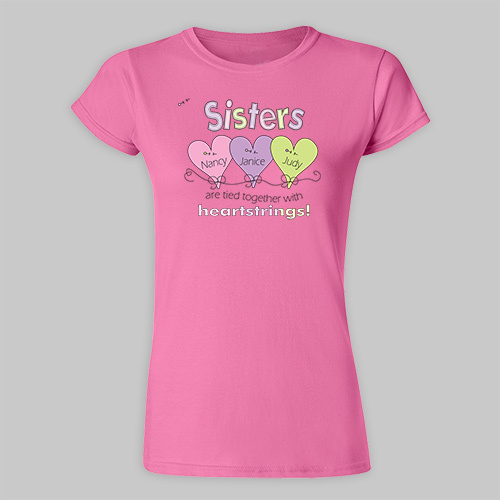 Your Gifts for Sisters T-Shirt is available on our premium 100% soft-style cotton, Personalized Women's T-Shirt, machine washable in adult sizes S-2XL. Shirt is 4.5 oz, pre-shrunk, double-needle stitched sleeve and bottom hemmed. Includes FREE Personalization! 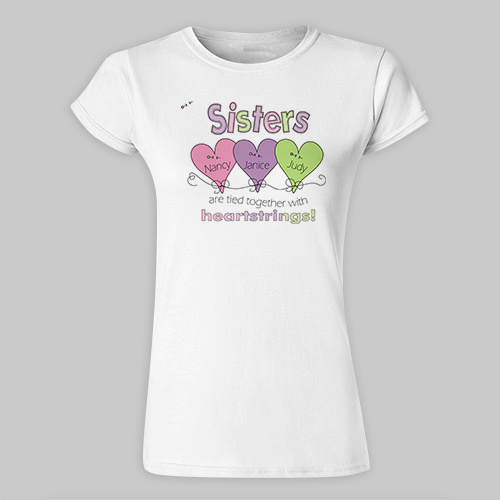 Personalize your Sisters T-shirt with up to 6 Sisters names. They are so nice!! Really good quality. Thank you. I loved this product, I can't wait to give them to my sisters. Loved the tshirt and excited to give to my sisters as their Christmas gift!